Laser hair removal delivers unbeatable results, but let’s face it – it can be painful. But beauty is pain, right? Not necessarily. What’s the secret to pain-free laser hair removal? Numbing creams. Now you can have your cake and eat it, too. If you are looking for a numbing cream for waxing or epilating, you are still in the right place as the cream will work just as well for you as someone having laser hair removal. Studies have proven that some people are more susceptible to pain. For instance, red heads tend to have a greater pain sensitivity. If you are not a red head, you may still be more sensitive to pain than other people. There are a few different types of numbing cream that you can get, but the main two types are lidocaine cream or benzocaine creams. They are both act as an anaesthetic. They are often used to treat itching, soreness, minor burns and wounds. I do tend to find that the lidocaine creams numb the applied area much quicker as the cream is more water soluble and tends to last longer than the benzocaine. If the two ingredients are so similar then why don’t the cream manufacturer’s just use either lidocaine or benzocaine? Both are tolerated well by the human body, but some people may be allergic to one of the ingredients. However, quite often these people aren’t allergic to both ingredients so if they are allergic to lidocaine then they might not be allergic to Benzocaine or vise versa. We do recommend that you do a patch test with the creams before applying to a large area to see if you are allergic to the creams. There are a lot of numbing creams on the market. Which one do you choose? We’ve done all the hard work for you, and have rounded up the five best numbing creams on the market. Numb Master is a doctor-recommended topical anesthetic cream that works (almost) like magic. The numbing effects are due to the 5% Lidocaine in the formula, the key active ingredient. According to the manufacturer, liposomal lidocaine is better at reaching deep into the dermis and epidermal layers, which is where pain receptors are located. The great thing about this cream is that the effects are long-lasting – about an hour. It starts taking effect in as little as 20 minutes, which means you can put on the cream before you leave the house, and enjoy a virtually pain-free laser hair removal session. And when you’re done, the cream washes away with simple soap and water. Numb Master gets our vote as best lidocaine cream. The HUSH anesthetic cream is actually designed for tattoo pain, which means it’s pretty powerful and effective. The great thing about this cream is that its effects last up to four hours. Just like Numb Master, this cream’s active ingredient is Lidocaine, but this formula uses a concentration of 4%. Not only can you use this cream for laser hair removal, you can also use it for tattoo pain, electrolysis, waxing, piercing, permanent makeup, and even tattoo removal. It’s also FDA compliant and does not contain Epinephrine. You can use HUSH on any part of the body, and it’s safe for sensitive skin. The only downside? The manufacturer recommends applying the cream to the affected area, and then wrapping it in plastic wrap for an hour to boost absorption. While not a deal breaker, you will need to plan ahead when using this cream. The results are worth the wait, and the effects kick in pretty quickly. At first glance, you may overlook TOPICAINE because of its higher price tag, but you get 4 ounces versus two or one with our second and first picks respectively. Like the other creams on our list, TOPICAINE’s key active ingredient is 5% lidocaine. This is what actually numbs the skin, and it reaches deep into skin layers to reach the pain receptors. With a recommended application time of 30 minutes to one hour, you’ll need to time your use properly. What we really like about this cream is that its additional ingredients are soothing and beneficial for the skin, which is great for post-laser treatment. All of these ingredients are excellent moisturizers for the skin, and the Aloe Vera also soothes the skin. If your skin has a tendency to get irritated after laser treatments, this may be the right cream for you. Even if irritation is not a problem, this cream’s moisturizing properties will keep your skin looking its best before, during and after your treatments. 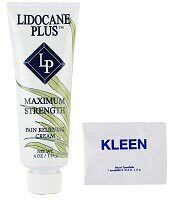 If you’re on a tighter budget, Lidocaine Plus Cream is a smart option. The only drawback with this cream is that it acts as more of a relief cream than a numbing cream. The key active ingredient in this is 4% lidocaine hydrochloride. It’s recommended for use on pain caused by minor burns, sunburns, scrapes, cuts, insect bites and other minor irritants. This cream will alleviate your pain, but it won’t numb your skin. I highly recommend Lidocaine Plus as an after-treatment cream. It’s excellent at alleviating pain, but if you’re looking for a cream that will numb your skin during treatment, you may want to choose one of the other options on our list. With that said, this cream is my go-to choice for post-treatments. And its formula also includes Aloe Vera, which is excellent for soothing skin irritation. The No Scream Cream is actually made for waxing – ouch. But it’s powerful enough to numb the skin for laser treatments, too. It’s not quite as effective as the first two creams on our list, but if you’re on a really tight budget, it’s a great option. 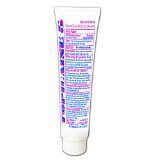 Unlike the other products on our list, the No Scream Cream actually uses a formula with 20% benzocaine to numb the skin. It takes about 30-45 minutes to kick in, but the results are excellent. And if it’s good enough for laser hair removal, I’d imagine it would work wonders for waxing, if you choose to wax in the future. Priced at just a little over $15, this cream is worth every penny. And it doesn’t have an unpleasant smell, which can be a concern with some numbing creams. I highly recommend that you give this cream a try if you’re just getting started with numbing creams and aren’t sure how you’ll feel about them. If you can’t stand the pain of laser hair removal, these creams will help make the entire session more comfortable and pleasant.